If you’ve ever struggled to convert a recipe from ounces to teaspoons, then you’re someone that could use the help of the Liquid Volume Calculator. This calculator template will take the figures of what you need to convert and provide you with a list of all the possible liquid units of measure that you could possibly use. This template is quick and straight to the point. Best of all, it saves you time that would otherwise be spent on more important things, such as cooking or anything else that you may need this template for. To download the free template to your computer, scroll down to the bottom of this page and follow the link that has been provided for you. When you’re ready to start converting units of liquid with this template, click on the “Volume Unit” cell to the left of your screen. You will see an arrow in the corner of this cell; click it to bring up the drop-down menu. Choose the option you want to convert from. 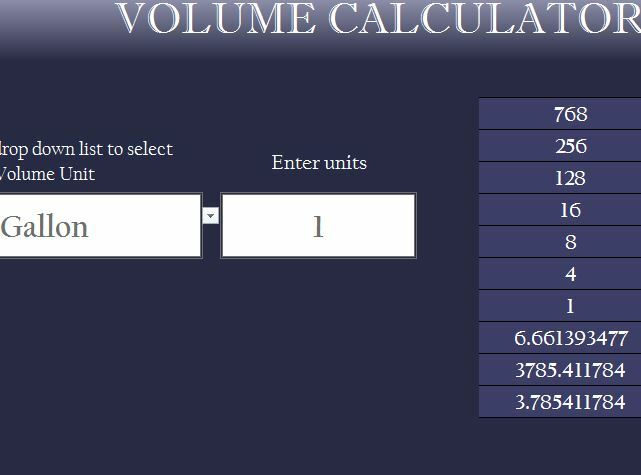 The next step is to enter your number of units in the cell adjacent to the “Volume Unit” cell. The template will then take all that information and give you a list of conversions on the right-hand side of the page. You would simply look through this list to find the conversion you need. In the example given, you are shown the conversions for 1 gallon. If you need to convert that to quarts, you would see that 1 gallon is equal to 4 quarts. You can see how easy it is to convert different units of measurement for liquids with this template. Entering information is simple and quick. Calculations are done automatically for you. Provides you with every conversion with each use.